Well, if you are a nrp male going for more contact in court you are going to lose anyway, so you may as well go down fighting. Don't shoot the messenger. Tough on him, tough on the causes of him as Tony Blair might say. Judges attitudes to nrps are disgraceful and that is the real problem here, that providing there is some contact (anything), they just aren't interested in doing anything. If you get a contact order for every other weekend and half holidays (bog standard), then she just offers some of that and don't turn up for the rest, court will not do anything, they are useless (speaking from experience) and I can understand the man's frustrations. If it came to a choice between him and the Judges, I have more respect for him. These courts are rubbish, at least his argument had some merit. For example, when I said a particular type of contact worked for me the Judge said it's the child we are interested in. When ex wife said something works for her (not the children), the Judge accepts it. They have no authority as their interpretation of children's interests are "what mum says, goes, providing there is some contact (any contact)". This is wrong, they are living in the past and should understand that men are good parents too and nrps have an important healthy role to play also. *not* a good model? Oh, F**k, too late I submitted my skeleton, the Court of Appeal are gonna be pissed off with me. Ah, but I'm sure you worded yours with your usual style and panache, Geeklawyer - they'll never notice. Yes, they are. More specifically, biased against nrps. When my ex wife breaches a contact order, she gets told off if it goes to court, it is not worth going to court for that, waste of time. If you get to court on these things you have lost anyway as works with parent's co-operation and conversely, it doesn't - especially given that the Judges aint interested - as I said above. Contact works with parents co-operating, but not when they don't. Court seems to make things worse, so really it comes down to poor Judges or hoping the pwc is decent. Biased in favour of PWCs, rather than men and your attempt to lable me as sexist was illustrative of it and the casual bias and cliche nature of lawyers and judges opinions of people who criticise the system. I am due in court next month on this issue, trying to get more contact, against ex's wishes, and in line with Cafcass recommendations, you come along, see how biased they are, Reading, your old uni town, I think I know now I won't get it. It's like Euan McGreggor in Brassed off, he knew people would vote for the package, but he voted to carry on working, sometimes you have to try, I do so for my children and your snide response is pretty poor and against every thing I have seen in the 40 or so times I have been to court on this. They get away with it because they are closed courts and people with posh words and voices spin a line that they are fair, they are not. Parties who think that the world is against them should generally look to themselves for the reasons. Yet more cliche. Well, I have looked long and hard. Wrt this judgement, I have just read it and it is a mess. I have made 4 applications in 5 years, 1 for a contact order, 2 to enforce it and 1 to appeal her order restricting contact, made in my absence with no evidence (outstanding) and mine is turning into a mess also. I do not think the world is against me, just people like you and you are wrong to be so. Personally, having read a bit of this I think the bloke was probably over doing it, but I am not sure how much contact he is having, I think he may just be a vexatious littigant. I get very little and have no option but to go and I am dreading it and Judges with the kind of patronising attitude that you seem to have also, they imply "get out of my court", trust me I'd rather not be there. If I was younger I'd start calling you names at this point, but I think you get the message. I don't think the world is against me. You want clichés, here's one, You are what you talk about. There seems to be something about the inperonality of the internet which turns their writing insulting. I'm sure we are both really nice people, at least I am. It's good to have somewhere to read and comment on this stuff though, makes me feel less mad and isolated and the father's groups seem a bit ott. Although I do understand why. I am not against you, Graham - just trying to help. Glad you found the blog beneficial. How much contact was / is this chap ordered and getting anyway please? I can't make it out from the text (another one of my criticisms of the law) to understand what they are talking about. Sorry, I don't recall, but it should be mentioned in one of the previous 2 reports, both of which are linked in the judgment. Thursday evening til monday morning every other weekend. It is not enough, when are courts going to realise that you can't keep the special relationship going on an every other weekend basis. That is the problem here. Don't blame the nrps or shoot the messengers for it, that is my point. We have an unstoppable force (nrps wanting more contact) meeting an immovable object (Judges going with every other weekend where no agreement). Thus we have the tittle tattle and name calling from both sides, would help if these places were open for the public to make an informed decision rather than reading all this, which doesn't quite do that i think. I stick by my first post. Judges and Cafcass (Guardian) being nasty and unprofessional as per usual. I know the father in this case and his son, so won't expose myself to an allegation of bias by defending him. What I will say is that the case shows very well the limitations of the court process and the inability of the courts to deal with this sort of dispute (which began as a financial dispute). I'm afraid the court system doesn't come out of this case with any more credit than the parents. There have been numerous instances during the proceedings of dubious process, such as a judgement given in the father's absence (he was legitimately absent due to illness), a consent order made against the father's wishes, and contempt of court by CAFCASS. It is also hardly just that the judge can say what he likes about the parties, but they cannot comment on their own case. As we saw with hindsight in the Mark Harris case, Munby's opinions are not always correct. I won't get into the argument again about family court bias against fathers, but if there is one thing the courts dislike more than an nrp it is an nrp who campaigns against them. The father in this case is a brave man. Still, I'm sure the skeleton caused much amusement amongst lawyers. Ah, the 'family justice system as entertainment for bored lawyers' justification. Aquinas would be proud of you. Doing this job, we have to get our laughs where we can! Perhaps we should also consider the very important role this case has played in extending the options for using McKenzie Friends, particularly where right of audience is concerned, resulting in Potter's revision of his President's Guidance. I took the time to read through your posts, and you sadly seem arrogant, and ignorant. You fail to take notice to so many cases where justice does not prevail. Sometimes one is right to blame the system, and sadly it is that way more often than not.. How have you and so many like you missed the critical fact that these are people's lives. Judges pay no mind to what their actions cause, for they are just doing a job. Many judges lack the common sense that is needed to hand a ruling that would benefit everyone involved. If you choose to point the finger at the man who made his pleading, ask yourself......If this was me, how would I react. Fact is most people cannot afford to hire an attorney, let alone pay to go to school to become one. Only a handful of judges do not become the monster in the robe. In fact when they put the robe on, they no longer look at the world as it truly is. They transform into a system that fails many. I would guarantee that even you yourself would view things differently if you were to take the place of a judge. Compassion, and the need to "help" find the best solution for both parties falls wayward, as you figure out what is the quickest way to get this done so you can move on to the other cases. The bare bones of the truth i,s that all over the world the system that is supposed to help and protect, FAILS. If one is going to be responsible for altering lives of the people they see, then it should be a requirement for them to have compassion and understanding for the choices they make. But I do not expect you to understand, for you do nothing more than make your paycheck, and as long as you can do that, there is not need for compassion and understanding. If your not part of the solution, then you are part of the problem. LOL,,,,,, Well, at least my comment has substance,. Good day! I don't want to belittle your arguments in any way, but if John simply wanted to "pick up a pay check", he, and the rest of the children lawyers in the country, would have chosen a different area of law to practice in. Family law is emotionally demanding, sometimes draining; we spend most of our time counselling our clients, treating them with compassion in the hope that they can return that compassion to their children and their ex-partner, and reach a solution that minimises the trauma that the breakdown of the relationship between their parents almost invariably causes the children. The same applies to judges; if they were not concerned by the welfare of children, they would have purused higher paid careers elsewhere. It is unfortuante that you have had to act on your own behalf in your litigation; you may have benefitted from the advice of an experienced lawyer able to both protect your interests and negotiate a resolution of the issues between yourself and your ex-partner. I have been against many LIPs who have ended up asking me for advice! You only see a small picture... Please take a moment to read and look around the link above. I am not a father that needs advice on how to negotiate. The court system fails way to many. RY: Many thanks for that. TJ: We are fully aware that many are not happy with the family justice system (and I certainly do not need to visit any more websites detailing injustices, whether real or perceived), although many of those who have had bad experiences only have themselves to blame. However, having worked in the system for 25 years I can tell you that the vast majority of cases have satisfactory outcomes. And no, I am not being complacent - I am fully aware that the system is not perfect (I doubt that there is any such thing as a perfect system), and we should constantly look for ways to improve it. Again, you have done nothing more than confirm my first post. Had you taken the time to look at the link, you would have realized that it was not another post about someone thinking the system had let them down. When in fact it was a study done by Daniel G. Saunders, Ph.D. in consultation with Karen Oehme. Also, the Journal of Child Custody and Journal of Divorce and Remarriage, one study called Thematic Trends and Future Directions. by Professor of Sociology, Michelle Bemiller, Kansas State University, are also very interesting. Funny how you say the "injustices, real or perceived" are solely the result the of a person,(something they said or did?). But then go on to state that you are aware that the system is not perfect, and we should always look for ways to improve it. SO, I ask you to clarify: Is it the person, or the imperfect system that needs to change? You seem to be very closed minded to the idea that there may actually be some validity is someone's "perceived injustice"
I am however, certainly not so naive to jump on every person's victim of injustice band wagon. I am fully aware that there are far to many who cry, only because they did not get their way. 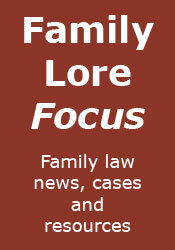 What I do know is that there is a silent social epidemic that has worked its way into the family law system. This social epidemic is growing at alarming rates. Did you that roughly 80% of divorce's where children are involved are resolved without a custody dispute? BUT then you have the other 20% and that's where the number looks small but the outcomes are potently devastating. This % includes the "High Conflict" cases. Most of the time there are a high numbers of abuse allegations by one parent or the other included in this small %. This is where the "perceived" injustice comes into play. The even more alarming issue is that in most contested cases where abuse was substantiated, the abuser got custody, because the courts either down played the abuse or just didn't take the time to look into it. Now you have these "high Conflict" cases where the very system set in place to protect, has now been utilized as the tool to continue the abuse. Take a guess as to who suffers? Not the parents who can't seem to negotiate. Its the children who suffer the injustice. I want to take a second to point out that I work with abused and neglected children, and so many cases started out in the family court. Worse yet are the cases that did not make it into the juvenile courts. Ex. Father reported mothers instability and abusive behavior, courts felt it was a tactic. 2 weeks later mother killed all four of her children. Another case mother went to the courts for protection for herself and her son, the judge blatantly stated that one of you is lying and I think it's you, indicating the mother after he found out they were in a custody battle then went on to tell mom he did like these kind of tactics to get the upper hand. Father ended up killing the son. Are these "perceived" injustices? John, you are so quick to point the finger at the person complaining and most likely believe that even I comment because of some "real or perceived" injustice. That you would not even entertain the idea that maybe, just maybe my statements may actually hold some water. You are correct that the vast majority of your cases, and many other cases turn out satisfactory. My concern is the minority of cases that do not, for this is where the real issues lie. You went on to say we need to always look for ways of improving the system, then why not take the time to see a bigger picture. Out of every 100 cases 15 to 18 cases are handled improperly. you start adding up the numbers and its clear to see that there is more than just an imperfection, or a case of one's own doing. This is a big issue. I could take the time to clarify my earlier post, and show how these statements relate to one and other but not sure it would be appreciated. (Yawn). Points already answered 100 times on this blog. My best advice to you is to stop dwelling on this, and move on in your life.